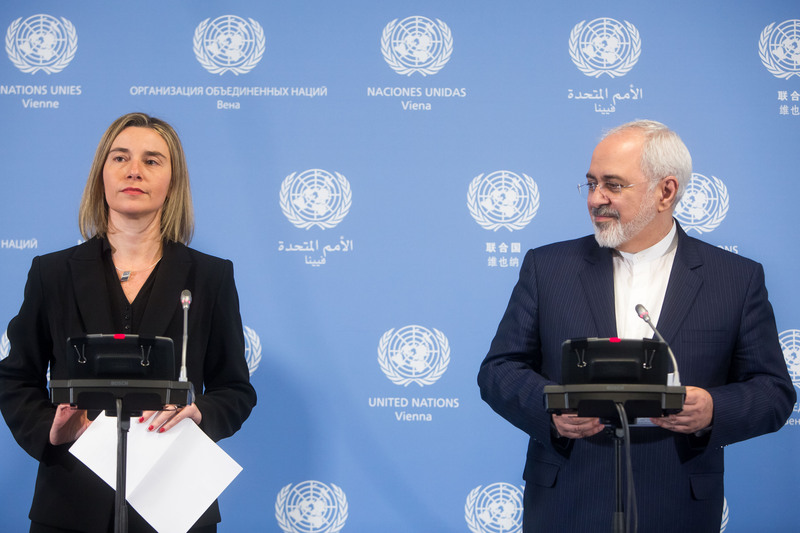 EU foreign policy chief Federica Mogherini, representing the six world powers, announced the lifting of “multilateral and national” sanctions in Vienna on Saturday (16 January), saying the nuclear deal showed that intense diplomacy could resolve even “the most difficult issues”. Iran has “opened a new chapter” in its ties with the world, President Hassan Rouhani said on Sunday, hours after sanctions were lifted. The UN’s atomic watchdog late on Saturday confirmed that Iran had complied with its obligations under last summer’s accord and the United States and European Union announced they were lifting the sanctions that have for years crippled the country’s economy. Western governments hailed the announcement as a milestone though some critics, including Israel, alleged that Tehran was still seeking to develop a nuclear weapon. The announcement followed news of a prisoner swap between Iran and the United States that will include the release of Washington Post correspondent Jason Rezaian, in another sign of thawing relations between the longtime foes. Rouhani, a moderate whose 2013 election victory helped launch a huge diplomatic effort toward the deal struck on July 14 in Vienna, said implementation of the agreement did not harm any country. “We Iranians have reached out to the world… have opened a new chapter in the relations of Iran with the world,” the official IRNA news agency quoted Rouhani as saying. Iran is “not a threat to any government or nation”. The agreement, he said, “is not a loss for any country”. Rouhani, who has promised that 2016 will be a “year of prosperity” for Iranians, was to give a press conference later Sunday after presenting this year’s budget. The lifting of the sanctions will allow Iran to resume widespread oil exports, long the lifeblood of its economy though Rouhani has steadily moved away from relying on crude to fund budgets. The deal will also open up business in the 79-million-strong country. The Vienna agreement was nailed down after two years of rollercoaster negotiations following Rouhani’s election. The highly complex deal drew a line under a standoff dating back to 2002 marked by failed diplomatic initiatives, ever-tighter sanctions, defiant nuclear expansion by Iran and threats of military action. In addition the nuclear talks put Iran and the United States on the road to better relations, more than three decades after the Islamic revolution that toppled the US-backed Shah. Four of the five detainees to be freed by Tehran under the prisoner swap, including Rezaian, were still in the country as of early Sunday, with a US official saying “logistical steps” were ongoing. Under the exchange, Washington said it had granted clemency to seven Iranians, six of whom were dual US-Iranian citizens, and dropped charges against 14 more. International Atomic Energy Agency chief Yukiya Amano was also due in Tehran on Sunday for talks on the UN watchdog’s enhanced inspections to ensure Iran’s continued compliance with the deal. The steps taken so far by Tehran extend to at least a year – from a few months previously – how long Iran would need to make one nuclear bomb’s worth of fissile material. They include slashing by two-thirds its uranium centrifuges, reducing its stockpile of uranium – enough before the deal for several bombs – and removing the core of the Arak reactor which could have given Iran weapons-grade plutonium. Iran has always denied wanting nuclear weapons, saying its activities are exclusively for peaceful purposes including power generation and medical research. Critics, including US President Barack Obama’s Republican opponents, have poured scorn on the deal, saying it fails to do enough to ensure Iran will never acquire the bomb. Israel, widely assumed to be the Middle East’s only nuclear-armed state and Iran’s arch-foe, has repeatedly slammed the agreement. Israeli Prime Minister Benjamin Netanyahu said Saturday Iran “has not relinquished its ambition to obtain nuclear weapons, and continues to act to destabilise the Middle East and spread terror throughout the world”. Sunni Saudi Arabia, Iran’s main regional rival, is also alarmed at the prospect of warmer US-Iran ties and of predominantly Shiite Iran, newly flush with oil revenues, increasing its influence. Tensions between Saudi Arabia and Iran, already fighting a proxy war in Yemen and backing opposing sides in the Syrian conflict, have reached new heights in the past two weeks. Saudi Arabia and a number of its Sunni Arab allies cut diplomatic ties with Tehran earlier this month after protesters angry at Riyadh’s execution of a prominent Shiite cleric on January 2 sacked its embassy in Tehran. Iran’s imminent return to the oil market has also contributed to the sharp slide in the price of crude to 12-year lows of under $30 per barrel this week, putting public finances in Gulf nations under strain. Gulf stocks tumbled on their first trading day of the week on Sunday, with the Saudi Tadawul All-Shares Index opening down 6.5 percent and the Dubai and Qatar exchanges both diving 6.0 percent at the opening. The nuclear deal has more than a decade to run, which is likely to be a bumpy road, experts say, not least if more hardline governments take power in Tehran or Washington. A “snapback” mechanism ensures that many of the sanctions can be swiftly reimposed, and a special joint commission is meant to handle any misunderstandings. ISN’T ALWAYS A GOOD SIGN THAT COUNTRIES AND THEIR LEADERSHIPS SHOULD TALK TO EACH OTHER? FOR TOO LONG THE WORLD’S NATIONS KEEP LOOKING BACKWARDS TO THE PAST CELEBRATING IMPERIALISTIC ISSUES AND POWER AND WARS OF ATTRITION WHEN THE WORLD NEEDS TO MOVE FORWARD AND DECIDE TO TACKLE THE IMPENDING AND LOOMING HUMANITY AND ENVIRONMENTAL CRISES. TURN SWORDS IN TO PLOUGH SHARES FOR ONCE. WHY NOT SEEK TO USE THE ALTERNATIVE NUCLEAR FUEL THORIUM AS A FUEL FOR POWER STATIONS AS THE INDIAN AND NOW THE CHINESE ARE VIEWING. THE OLD FORMAT OF NUCLEAR POWER IS BASED UPON FINDING A USE FOR THE SURPLUS FUEL FROM MAKING TOO MANY NUCLEAR WEAPONS WHICH THEN HAVE HALF LIVES MEASURED IN 1000S OF YEARS RATHER THAN THE DECADES AND LESS OF THORIUM. AND INDEED IF THE WORLD’S NATIONS WERE REALLY INCLINED TO TURN OVER THEIR ECONOMIES TO MANUFACTURE RENEWABLE ENERGIES TO OBVIATE AND SUPPLANT THE USES OF FOSSIL FUELS [SUCH AS OIL, OR “”SO-CALLED”” NATURAL GAS AND COAL ETC.,] BY MOVING FORWARD WITH RENEWABLE ENERGY SOURCES SUCH AS THE USES OF THE NEW GENERATION OF SUPER-EFFICIENT PHOTO-VOLTAIC CELLULAR SYSTEMS THAT CAN BE PAINED ON ANY HOUSE MAKING THEM SELF-SUFFICIENT IN ELECTRICAL ENERGY AS WELL AS BEING ABLE TO STORE SAME FOR OVER 14 DAYS AND MORE SUCH UNITS ARE CAPABLE OF BEING BUILT FOR LESS THAN A QUARTER OF THE CURRENT SYSTEMS AND PRODUCE 40% MORE ELECTRICITY OVER THE SAME AREA. IF THE USA WERE TO CUT BACK ITS OVER-BOURGENING AND MASSIVE ARMAMENTS AND RE-ARMING BUDGET BY 20% ALONE AND DIVERT THIS TO RENEWABLE ENERGY AND FUEL DEVELOPMENT AND OTHER COUNTRIES COPIED THIS IT WOULD BE A REAL STEP IN THE RIGHT DIRECTION. BUT OF COURSE IT COULD NOT AS IT IS STILL LOOKING BACKWARDS TO PAST GLORIES JUST AS MANY OTHER COUNTRIES ARE DOING.